If you’ve wanted to learn to abseil, now is your chance! Phuong and I will be running a beginners abseil course in Clovelly. 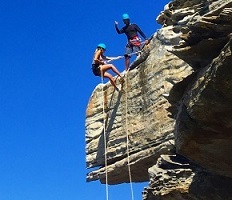 We will get you to the point where you’re ready to participate in abseiling trips and abseil dependant canyons! We will take you through a comprehensive and fun day where you will learn…. – Can walk up four flights of stairs with relative ease. – Get yourself to Clovelly by 9:45am on Sunday the 22nd of April for a 10:00am start (we will try and co-ordinate lifts from UTS if we can). If we have time and if you’re lucky, you may even get some more advanced techniques from Grand Master Phuong! We’ll confirm all participants by Wednesday the 18th or earlier. We’ll give some preference to anyone who can drive and convey people from UTS Building 10 to Clovelly. So get signed up and good luck!